Finding the best ukulele is quite hard – the market is big, and the manufacturers constantly make better and better models, so it’s hard to choose which one is the best. In this review, we’re going to discuss which ukulele to buy and where. First of all, we should put a line of distinction between some of the “best” ukulele models and those instruments that are “high-end”. The best Uke may as well be the “cheapest” while being expensive doesn’t necessarily put you in the top 10 list. Knowing what is the best instrument to buy takes a certain dose of skepticism towards the price. Now, in order to fully grasp the difference between a “good” and “bad” ukulele, you should try out different models, or at least search for reviews of different models. See what other people say and how their experiences seem when compared to each other. The best Uke shouldn’t be too expensive, it should come with at least one complementary feature (at least a gig bag, or a tuner – those things aren’t expensive to buy standalone). It should also be durable, and it should look the part. In our following ukulele reviews, we will be looking at the top 10 models of ukuleles that fit these criteria. Diamond Head’s DU-150 Ukulele is a traditionally-shaped mahogany soprano ukulele. It’s essentially a budget instrument that most beginners would love for its affordable price, but that shouldn’t give you the wrong impression. It’s capable enough of satisfying the needs of more seasoned musicians. This ukulele features a durable maple body, a maple neck, and a beautiful white hardware set. The high-gloss finish makes it look ravishing, but it also makes it quite sturdy. The special geared guitar tuners are also a part of Diamond Head’s DU-150 design, and they make sure that this ukulele remains in tune at all times. The DU-150 comes with a set of Nylon ukulele strings which provide excellent sound. These strings are very easy to fret, especially for beginners. The easy action further improves the play-ability of this guitar, but it’s safe to say that the key factor in this matter is the fingerboard. It’s supplied with smooth, polished frets that feel gentle to the skin while playing this ukulele. All in all, this is a very valuable budget ukulele. 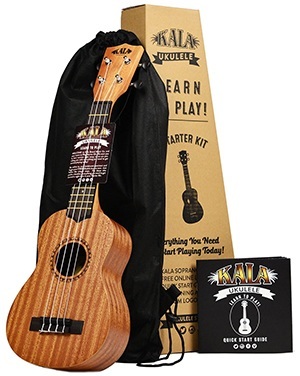 Kala makes some of the best ukuleles out there, and the KA-15S is the “living” proof of that. The model we’re reviewing is KA-15S Mahogany Soprano, but you can also check out the Red, Baritone, Concert, Hawaiian Islands, Spruce, Tattoo Band, and Tenor models from this series. The Kala KA-15S Soprano features a Mahogany construction (body & neck are from mahogany), a rosewood fingerboard, and a rosewood bridge. There is a total of twelve brass frets on the rosewood fingerboard, with fret markings on the fifth, seventh, and the tenth fret. Here's the difference – most brands mark even the twelfth fret, but the folks at Kala don't. 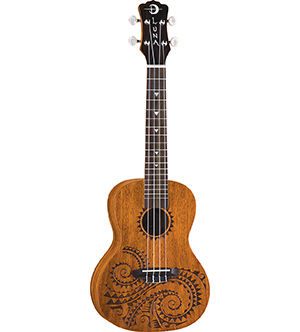 This model comes pre-strung with the premium-quality Aquila Nylgut Italian ukulele strings. They’re pretty much a standard for every good quality ukulele. Wrapping it up, Kala’s KA-15S Mahogany Soprano is an excellent ukulele for beginners, for practice, or for those people who just want a beautiful instrument to play on from time to time. It’s not concert-ready, though Kala offers a variant of this model that is. Mahalo’s Starter Ukulele pack is simply perfect for learning the basics of Ukulele playing. It earned its place among the best Uke instruments for several reasons – mainly because of its affordability and play-ability. First of all, Mahalo’s Rainbow Series offers quite a variety of colours. You can choose from 11 different colors including brown, green, pink, yellow, orange, and white. Each model comes with the same characteristics and features, so all you need to do is pick a color you like the most. Secondly, the Learn-to-Play bundle comes with all the necessary gear and equipment a musician can want – a carrying bag, and Ukulele Digital Lessons. Furthermore, the design of this ukulele is very specific – the space between frets is even, but each fret is quite big, so you won’t have a problem grasping them firmly. Most people get stuck on their progress route due to small frets, since it’s difficult to play chords. This ukulele comes with a set of Italian Aquila ukulele strings, the NuBone Bridge Saddle, and gold-plated machine heads. This bundle is very affordable, and it’s very valuable for the cash. ADM’s Ukulele starter pack is quite similar to Mahala’s Rainbow series. It offers a large variety of products, it has twelve large frets, and it’s quite affordable. Now, this ukulele isn’t only ideal for starters – it’s practically made for them. You get a whole bundle of complementary features along with a premium-quality ukulele that offers hours of fun and enjoyment. ADM’s Start Pack series features 5 models that are only different in color – the black, blue, brown, pink and mocha. The black, blue, and pink models come with gig bags with the same color while brown and mocha come with a black gig bag. 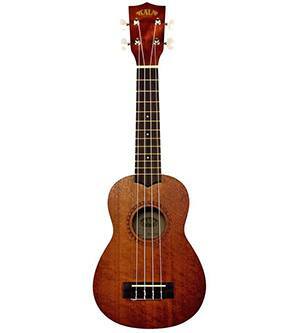 This traditional Ukulele features a b﻿﻿﻿asswood body construction and a set of nylon strings. Nylon is one of the best string material for beginners as it’s easy to strum and it provides a specific, pleasant sound. All in all, this is a great ukulele bundle. 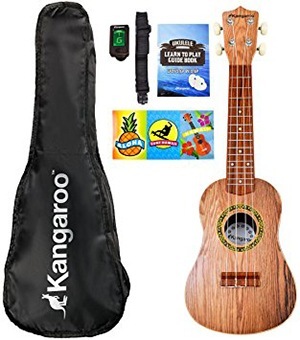 Here we’re looking at another beginner bundle, and you might be asking “how did this instrument get into the Best Uke category?”. This question is pretty good, but the answer would be obvious to you if you only had the opportunity to try this ukulele out. It sounds amazing, it looks marvelous, and it’s incredibly durable for a wooden instrument. This ukulele is made of mahogany, it comes with a complementary Tote bag, and you get a Starter Quick Guide which explains the basic principles of ukulele playing. This bundle is very affordable, and it might be your best bet of acquiring a top-quality Uke and the corresponding skills. The Kala Makala is an exotic Soprano ukulele – it got the name 'shark' from it's shark-shaped saddle, not because it “bites”. The neck of this beautiful ukulele is crafted of mahogany, while the fingerboard is made of rosewood. The durability of Kala’s Makala Shark is undisputed, but not absolute – you won’t have to worry about damaging this instrument. Kala’s Makala Shark comes in three different colors – black, blue, and green. The model we’re looking at here is the blue version, and it looks beautiful and soothing. The set of Italian Aquila Nylgut (Super series) strings are supplied, along with handy a carry bag. Essentially, this is a small, non-professional ukulele that is perfect for practicing at home, but it’s definitely not for concerts. The things you might like the best about this instrument are the affordable price and a high durability rating. 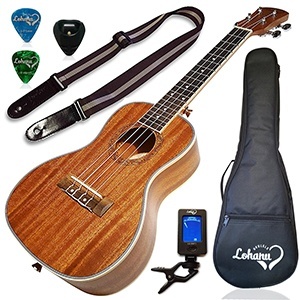 Lohanu offers one of the top rated ukulele bundles. 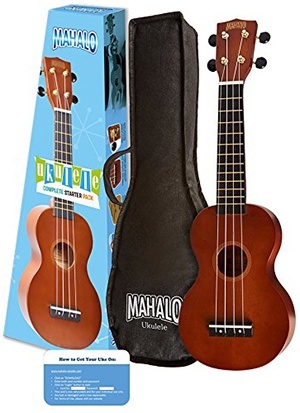 This ukulele features a longer neck when compared to other starter ukuleles, and a set of premium-quality complementary features. This bundle costs just a bit more than most ukulele sets we’ve reviewed so far, but it still belongs to the “budget” price point category. Lohanu’s Concert Ukulele is made of Mahogany (top, neck, sides, and back) and Rosewood (fretboard material), and it boasts a decent level of durability. The outward appearance of this exquisite Ukulele is plain and straightforward – there’s nothing too special about this ukulele's appearance. The Lonhanu concert bundle includes a ukulele strap, a ukulele tuner, the ukulele case, 2 ukulele picks, and a single pick holder. Kangaroo’s Ukulele is a guitar-like ukulele that’s perfect for beginners and intermediates. Even though it looks like a toy, it’s a full-fledged instrument. 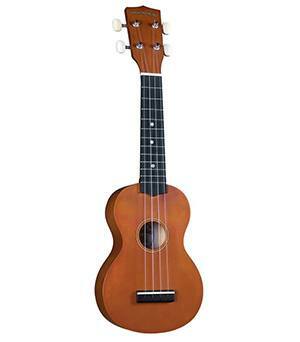 It’s longer than most beginner ukuleles and has 15 frets (most starter ukuleles only have up to 12 frets). Now, why is this ukulele so good for starters? It features a comprehensive instruction manual that features 46 pages of detailed instructions on “how to” play ukulele, along with some very easy to learn and fun songs. With this set you get 2 ukulele picks, a carrying case, a strap, and an electric tuner that helps you tune your ukulele with greatest precision and accuracy. The only downfall is that this ukulele comes stringed with a set of plastic strings which don’t sound as good as Nylon or metal strings. Summing it up, this ukulele set is a great way to obtain all the skills you need as a beginner, but it might not be so valuable to you if you already know the basics. It’s quite cheap, but it’s worth the money either way. The last Kala ukulele set in our review is also from the MK-S series. Here we have a Makala Soprano ukulele bundle that come in two color variants – with white or black tuners. The color of the hardware doesn’t have any impact on the performance whatsoever, and the change is purely cosmetic. 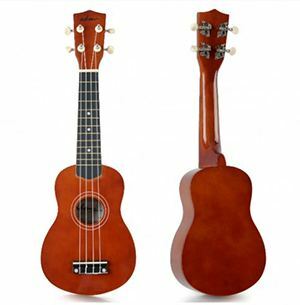 The Kala MK-S Makala Ukulele comes with Agathis body that features a special satin finishing touch. The Soprano size is ideal for beginners, but it’s not concert-able. The fingerboard and bridge are made of rosewood, and the neck is made of a beautiful mahogany. The third, fifth, and seventh frets are marked with white dots so that you have better coordination while you play. 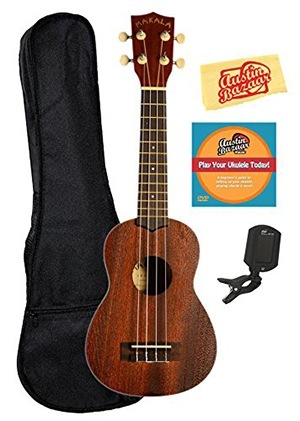 This ukulele bundle features a tuner, the Austin Bazaar “Play Your Ukulele Today” DVD, and a polishing cloth. The set isn’t too expensive, but we’ve seen cheaper ukulele bundles that come with similar complementary features. Either way, Kala’s MK-S Soprano Ukulele is very valuable for the cash. Luna’s Mahogany Tattoo Concert model is a very good ukulele. The size of this model is 23”, which is just enough to pass as a “concert” ukulele. The difference between a concert ukulele and a standard soprano ukulele is in the number of frets they have. Most standard ukulele models have 12-15 frets, and Luna’s Mahogany Series Tattoo Concert ukulele has 21 fret (you won’t use all of them, however). The top of this beautiful ukulele is made of solid spruce, and the sides, back, and the neck are crafted from mahogany. The entirety of this instrument is very durable, and it’s safe to say that this is one of the best-looking ukuleles that money can afford. It does cost quite a bit actually, but that shouldn’t dissuade you. Luna’s Tattoo Concert ukulele is a keeper. Now that you’ve seen our top 10 picks, it’s up to you to decide whether these ukuleles belong in the “best of” category or not. These ukuleles are definitely affordable, nearly all products come with a variety of complementary features, they offer a decent level of durability, and they surely are beautiful. Choosing a high-quality Uke among the manifold of products can be difficult these days, and the manufacturers aren’t making it easy for us – there are literally over thousands and thousands of products that look alike, but that are very different. Of course, there are different types of ukuleles that will suit some people more. The starter ukuleles are best for beginners, Concert ukuleles are best for professional musicians, while the Soprano ukuleles are good for people who play in an orchestra, and so on. All in all, there’s a “best Uke” for every category, and all of these 10 we picked are good in their own right.